What will it take for the ruling forces of our nations to admit that capitalism isn't working? Of course capitalism is almost never overtly talked about in the popular/mass media and certainly not in our governments. It is effectively veiled behind the supposedly neutral jargon of "the market" and "economics" both of which are used in place of "the capitalist market" and "capitalist economics". The legacy of the red-baiting 'fear of communism' tactics remains so strong that we cannot use what should merely be the name of one approach to economics - if we use the word "capitalism" in public discourse, we must go to great pains to project an air of neutrality that presumes that listeners will wonder if you're a socialist. Most people accept that we are in an "economic" crisis and not a crisis of "capitalist economics" (or, still more simply stated, a "crisis of capitalism"). Nor have the gargantuan relief efforts - cynically limited to the biggest institutions as well as cynically abused by those same institutions - shaken people's confidence in capitalism. After all, it's not capitalism that is failing, it's the economy - or so the mass of people would like to believe. If we cannot name the problem, how can we possibly hope to address it, let alone solve it? I'm not suggesting that what we are facing can be understood by pithy phrases, even though there is much truth in the "crisis of capitalism" naming. Capitalism, however, IS merely one system of economics - though it is the dominant one; and it is so by virtue of centuries of exploitation, war, genocide, theft and callous disregard for our shared planet (not to mention the plethora of ways by which we have learned to oppress: racism, patriarchy, etc.). But we cleverly disappear from the public mind the notion that capitalism is an historic choice and we teach ourselves to believe that it is a naturally inevitable evolution of human relations. Even while it leaves the majority of the world's wealth in the hands of the few; even while the system requires massive infusions of military spending and the ever increasing prison complex. And even while the system crumbles leaving growing numbers of people stressed, impoverished, fearful and destitute. I figure there are at least two REALLY BIG LIES that keep things going pretty much the way they are going. One is the too-benignly named "Myth of Progress" (with its corollary "development") and the second is the "Market". Both of these lies are part of a system of common sense that the majority of the population share. The power of these lies is precisely that they are treated as unassailable common sense. The history of human civilization is seen as the history of progress - sure there were the occasional set-backs, but overall, we have progressed from primitive hewers of wood and carvers of stone to electric, space-faring, cybernauts; there has been no obstacle that our science and technology has not been able to conquer. If the cost of our progress has been global warming, polluted waters, species extinction, well, it's just a matter of time before we invent something that will not only save us, but even accelerate our seemingly unending progress. And along with our faith in science we also have an enduring faith in the market where the solutions to many problems can be bought and sold. There are, of course, many other ideas and beliefs bound together into a formidable matrix. One that people feel may have flaws but that overall does the best job possible. And besides, bad guys do get caught (Kenneth Lay, Conrad Black, Martha Stewart, Bernard Madoff, Earl Jones). For thirty years, i have been a part of various movements researching, crtitiquing and advocating for alternatives to capitalist economics, politics and culture. And yet i've only seen capitalism grow stronger. So i wonder if there's a problem with the whole notion of alternatives which, by naming them so, tend to centre, in this instance, capitalism as the norm. And alternatives always seem second best and weak compared to the seeming robustness of the capitalist norm. But i also recognize that we are all deeply implicated in capitalist economics and depend on it for most of the necessities of life. And as we make changes, different choices, we must ensure that we do not create new causes of deprivation, exclusion, suffering. Not that this means that incremental change is the one and only path. There is enough suffering (due to lack of resources for many as well as excess of resources for the few) right now to deserve radical change. But our fears, our faith in the "market" and "progress", our forgetfulness about our interconnection with each other and the world all serve to keep us in the company of the devil-we-know. But the "Myth of Progress" is just a story - albeit a powerful one that is bolstered by the judeo-christian-islamic notion of the expulsion from and eventual to return Paradise). But there are other tales that could be told - cautionary tales such as that of poor, doomed Icarus; punished Tantalus; cursed Sisyphus; hopeful tales of clever fishermen, tricky girls, lazy rascals; adventurous tales of brave archers and fearless maidens. And we need to tell more stories - more diverse stories. David Noble, of York University, wrote an excellent book on this very notion: Beyond the Promised Land The Movement and the Myth (Toronto: Between the Lines Press, 2005). So, once having defined capitalism so minimally, we can now see differences that might not have been previously apparent. For instance, a self-employed person who "exploits" their own surplus labour doesn't fit this minimal definition of capitalism. Nor do co-ops whose members are simultaneously producers and owners (i.e. exploiters of their own surplus labour). In fact, once minimalized in this way, capitalism is suddenly crowded by many other economic practices which need not be seen as "alternatives" to capitalism, but as different choices of which capitalism is merely another choice. Of course, capitalism remains, for the time being, the dominant choice, holding a good deal of the marbles. But this new theory of "diverse economies" holds a great promise which, i think, can be seen immediately in the futures it allows us to imagine. And, once imagined, perhaps we can start to make our way more effectively towards those futures. Or, if the journey metaphor seems to set change outside of our horizons, we can use this theory to look around and see where the seeds of those imagined futures are to be found already growing! Seeds which include self-employed people, co-ops (worker co-ops, producer-consumer co-ops, food co-ops, multi-stakeholder co-ops), non-profit corporations, barter relationships, gift exchange, and more. Another seed is how we can reclaim the notion of "market" which is NOT synonymous with capitalism. A more complete picture of the market includes seeing that goods and services make it into the market in diverse ways. Sure, capitalist production is responsible for a good deal of what we find in the market. But other economic relationships also supply things to the market: co-op-produced goods, non-profit services, gift exchange and, of course, even theft. Which brings me to the Catalyst Centre worker co-op as one modest player in a diverse economic landscape. i don't know if a diverse economies approach to social and economic change will humble capitalism. But i do think that this economic theory offers is a new lens with which to think about production and exchange. What if there were ore co-ops producing goods and services. Add that to the number of non-profit corporations and self-employed people and then think, "what if...?" What if we at least started with co-ops and non-profits and credit unions maximizing their purchasing of goods and services from the co-op and non-profit sector? That would keep some money out of the capitalist economy and circulating in a different set of economic relationships. Nor do we need to de-link entirely from capitalist production and exchange. Diverse economics means that capitalism in one element of that diversity and, of course, for the foreseeable future, it is likely to remain that biggest bully on the block. But in time, could that bully be brought down to size? If we can strengthen the diverse economy, develop new economic ways of being, might we not be able to raise a generation of people who value these new ways of being enough to challenge capitalism's hegemony? I think it's worth trying and finding out. My theory with the popular education worker co-op (which is still barely getting by, financially speaking) is that our very membership could embody the very diversity of diverse economy. And, insofar as popular education is about both social and personal change (i.e. ethical self-transformation), a diverse economy practiced within Catalyst as well as between Catalyst and the rest of the world, would allow members to walk the talk in a profoundly more holistic and powerful way. Members would, of course draw some income from work with and through Catalyst. Additionally, however, members would be involved in gift exchange; collaboration between things they might be doing through self-employment (e.g. craft activities) and Catalyst programs; non-profit/charitable work (through grants and donations); and more. Seeign each member as an active participant in diverse economies is, in part, simply affirming something that has ALWAYS been true - each of us has always participated in a diversity of economic relationships, from the family economy, to under-the-table work (and even greyer type economic activity), to underpaid work, to the capitalist economy, and more. But we can go beyond simply affirming this diverse participation to evaluating our capacity (using some asset-based thinking) and choosing to strengthen those pieces with which we think, together, we can make a better world. 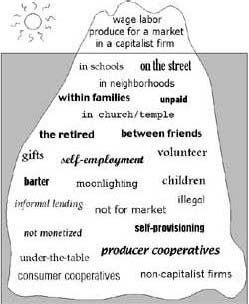 The iceberg image above makes a persuasive case for the amount of non-capitalist activity in which each of us in involved. What happens when we connect it all?